800 KGM vertical Hydrostatic Split Shaft PTO. It can provide 100% of input speed. The system can Engage/Disengage with pneumatic control. PTO outputs can be design with all ISO standard flanges as well as suitable pads for any kind of hydraulic pump and hydromotor. UARA.865 has 2 Hydraulic Pump Pads and 1 Hydromotor Pad and also, one more Hydraulic Pump Pad as optional. 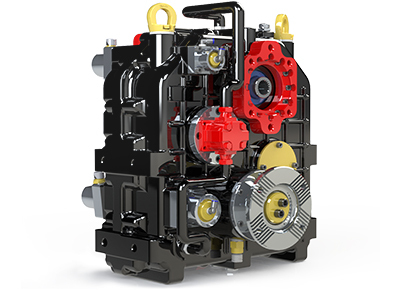 Cooling system, can be built on the Hydrostatic Gearbox as optional.